Do you pick? I mean, do you pick your own fruits and veggies fresh from the farm? We live just a mile from an incredible organic blueberry farm that offers nine different varieties of blueberries, and we make 2-3 journeys every summer to pick, and pick, and pick (and eat and eat and eat). Our kids love the experience of the multitude and expanse of bushes for as far as the eye can see. So many rows and rows of blueberry bushes are just the right amount of overwhelming goodness. As the girls have gotten older, they've grown to love the blueberry overall, also known as the strapped-on bucket to catch the motherload! We picked for about an hour and a half and brought home a great beginning with eight pounds of fresh Spartan blueberries. Now what to do with all of these? C has eaten blueberries for every meal and snack since we returned so we're already two pounds done with our first batch! Thankfully we're just steps away from our next pick. My hubby makes blueberry pancakes for us every Sunday after Church. That's another two pounds that will go by quickly. With a few of the remaining cups, I decided to try out a cobbler recipe I found from the great Pioneer Woman. Have you seen her stuff? Of course you have, she's so good. Well, about a month ago she posted her favorite summer desserts. I bookmarked and starred the post so that I could come back and enjoy when the time was right. 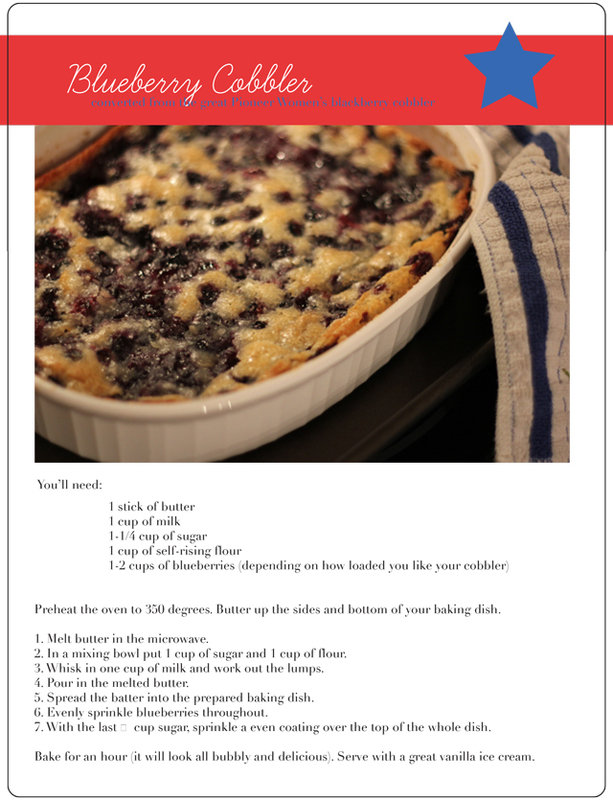 I reimagined her blackberry cobbler for blueberries. Here is what you need. Preheat that oven to 350. Melt a stick of butter in the microwave. In another bowl, pour out a cup of sugar and then add a cup of the self-rising floor. Whisk together to get rid of the lumps. Add 1 cup of milk (I love all the one cup measurements...super simple!!) Now pour in the melted butter and stir again. Coat a baking pan with butter - top, bottom, and sides. Pour in the batter. Place an even distribution of berries into the batter layer. Sprinkle on a nice, even layer of 1/4 cup of sugar (or more if you'd like). Pop it in the oven and go read your favorite blogs for a whole hour. The smells will delight you, I promise. And this is the beauty that awaits you. Scoop out a heaping helpful and top with vanilla ice cream. Yum, yum, yum.Do you find summer a great time to bake? Or to pick fresh from the farm? Thanks for hopping over, friends.